Sarasota, Florida – What shouldn’t you do while burglarizing a home? Fall asleep in the owner’s bed. Dion Davis was arrested by the Sarasota County Sheriff’s department after breaking into a residence, stealing the owner’s property and taking a nap on the owners bed. 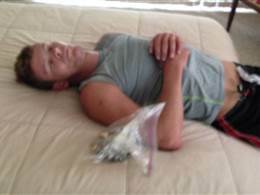 Davis was found asleep by the homeowner’s maid who quickly called 911 to report the napping burglar. It appears that Davis gained access to the home through a kitchen window. Deputy J. Allen says Davis was in such a deep sleep he managed to snap a photo of him before waking him up and arresting him. A bag of jewelry that Davis was allegedly trying to steal was also found near by. Burglary is a 3rd degree felony punishable by up to 5 years in state prison. Click to view the Florida Burglary Statute elements along with sentence.